Morocco has an interesting history unlike that of many other countries in Africa. Founded in 788 AD, it was its own independent state for nearly a thousand years during a time which many other neighboring countries were under foreign control. This has resulted in a country with many commonalities with its European neighbors, and its shared history and proximity to Spain gives it a familiar feel. Indeed, Europe is home to over 5 million Moroccans. These facts are probably why Morocco has been a frequent choice for international businesses to test their waters in African markets. This includes Canadian businesses and every year there are hundreds which process their Canadian corporate documents for use in Morocco. These include documents such as corporate resolution, corporate power of attorney, certificate of incorporation, articles of incorporation and many others. As you might have imagined, it is not as simple as merely sending these documents to Morocco in their original form. There needs to be a way for the Moroccan government and Moroccan affiliates to know that these documents are real and true. The most widely used process for this is called the apostille and Morocco is one of the many countries which uses this system. This may not be known as Morocco is a recent signatory to the Hague apostille convention, which Canada has not signed. Since Canada does not have an apostille process, it uses the original two stage process of authentication and legalization. Any Canadian documents that need to be used in Morocco need to go through this process. If you have been instructed to get a Canadian apostille for Morocco, this is the actual process you will need to go through and it is equivalent to an apostille. However, it is not nearly as simple. 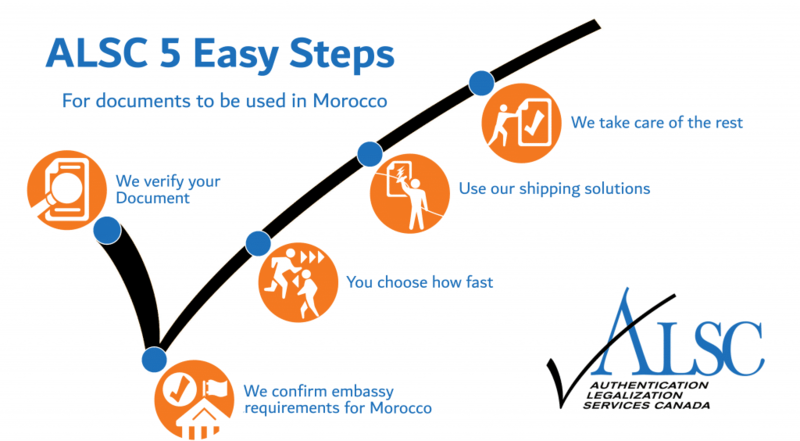 Authenticating and legalizing your Canadian documents for use in Morocco can easily take months even if you’re familiar with the process. This is because Global Affairs Canada takes 20 days to authenticate documents they receive and the Moroccan embassy has its own processing times which are subject to change. This does not include the time it will take to put together the necessary requirements for authentication at Global Affairs Canada and legalization at the consular section of the Moroccan embassy as well as the shipping involved. It is common for delays to occur at the legalization stage, since requirements at the Moroccan embassy can change frequently and sometimes even without prior notice. This process is very stressful as a result, especially if you have business deadlines to meet with your affiliates in Morocco. We saw the need for a service to simplify and expedite this frustrating and confusing process so that is exactly what we did. For over 25 years we have been processing Canadian documents for use overseas. We’ve helped tens of thousands of Canadians with their certificate of incorporation, articles of incorporation, board resolution, corporate power of attorney and many more for use in over 100 countries around the world and we are here to do the same for you. Our head office is located minutes away from Global Affairs Canada here in Ottawa. 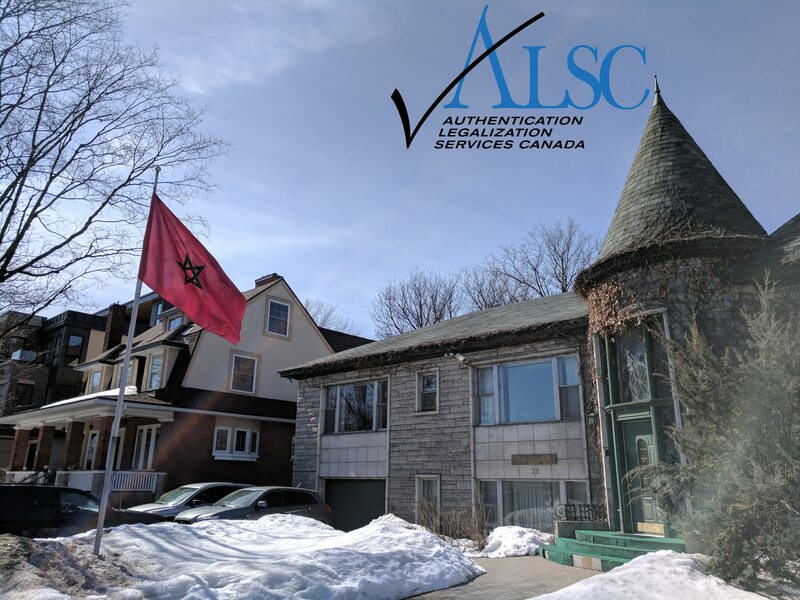 Although there is a Moroccan embassy in Ottawa as well, only their consular section in Montreal can legalize Canadian documents for use in Morocco. We have worked extensively with the Moroccan consulate in Montreal over the years and have developed a strong professional relationship as a result. This allows for facilitated communication which is often lacking if not entirely absent between consulates and their clients. It allows us to stay up to date on their changing requirements and fees and in some cases know in advance before they are implemented. What results is an unparalleled quality of service for you; a hassle free authentication and legalization process with minimal delays. Using our services is easy. Before starting, make sure you know exactly which Canadian documents you need to use in Morocco. When you start by contacting us, one of our experts will review your documents to ensure they are ready for authentication at Global Affairs Canada and subsequent legalization at the Moroccan consulate in Montreal. Next, we will assist you in ensuring you have all the associated requirements for legalization. Then you get to choose one of our 3 authentication service speeds. Our priority same business day authentication service means we authenticate your documents at Global Affairs Canada the same day they arrive at our office. Out standard 3 business day service and economy 10 business day service merge affordability with speed to meet your document needs. Now you are ready to complete our order forms. As in the previous 3 steps, one our agents will personally assist you with this. Once you have shipped us your documents and provided us with your order forms via mail or email, we take care of the rest. You will receive detailed updates at every step to know exactly where your documents are at all times. Our agents will also be here at all times during our business hours to answer any questions or concerns that you may have. Upon completion, we can ship your documents anywhere in the world they need to go via one of our recognized shipping partners. If you have Canadian documents that need to be used in Morocco, don’t risk delays, contact us instead. Our services are effective and affordable; our fees have not changed in 9 years. The remainder of this article contains additional details on some Canadian documents you may need to use in Morocco. If you are a Canadian business looking to partner with corporations in Morocco, modify existing subsidiaries, or put Canadian products on Moroccan shelves, you will need to provide a series of documents. Certificate of incorporation, articles of incorporation, board resolution, and corporate powers of attorney are some of the most commonly requested corporate documents for use abroad. The exact documents you will require depends entirely on what has been requested by your affiliates in Morocco. Make sure you clarify exactly which documents you need as miscommunication is one of the main causes of delays in international affairs. Indeed, we have had many of our clients turn back to us at the last minute having realized they were missing a Canadian corporate document for use in Morocco. Regardless of the corporate document you have, it will need to be notarized by a lawyer or notary public. You may already know this as well as where to get these documents if you don’t already have them. Some corporate documents are difficult to have reissued or cannot risk being damaged or lost. As such, it is always a good idea to make notarized copies of your corporate documents wherever possible for purposes of authentication and legalization for Morocco. Remember to check with your requesting parties if these will be sufficient. If you need articles of amendment or articles of amalgamation for use in Morocco and do not yet have the documents, you can start by filling out the forms which can be found by clicking here. If you have a Canadian certificate of origin or commercial invoice you may be interested in the “TradeCert” Certification Made Simple service offered by the Canadian Chamber of Commerce. They can certify your Canadian commercial invoices and certificates of origin in preparation for use in Morocco. What some of our clients choose to do is process their export documents through the Canadian Chamber of Commerce as their signatories are on file at Global Affairs Canada. This means they are valid for authentication upon issuance. If you choose to do this we can pick up your documents from the Chamber here in Ottawa free of charge. We can even process your certificate of origin and commercial invoice if you send them to use via email. Please contact our office if you are interested in either of these two options. Authentication and legalization can be a very difficult process. This is namely because not many people know about it until they need it. Once they figure out what documents they need, how they need to be prepared, and what additional requirements and fees they need, sometimes it’s already too late. Time is always of the essence especially when you are a business with deadlines to meet. Our services minimize delays and errors, and guarantee that your Canadian documents will be valid for use in Morocco. We have an A+ rating with the BBB and numerous, verified 5-star ratings on Google and Facebook which prove that our service is as good as it gets. We are even members of the Canadian Chambers of Commerce, a title which we proudly hold. This doesn’t stop us from looking for ways to improve our services for our clients and streamline the authentication and legalization process as much as possible. Over the last few years we have worked hard to open over a dozen service centers across Canada to better serve you. Once you have called our head office and become our client, you have the option to drop off your documents at any one of our service centers and have them shipped to our head office in Ottawa via FedEx free of charge. Once your documents have been processed we can send them back to our any one of our service centers free of charge for pick up by FedEx. Alternatively, we can ship them anywhere else in the world you want them to go at an additional cost. Save yourself stress and time; experience a level of service that you deserve. Click below to get started with ALSC, the experts in Canadian documents for use in Morocco!